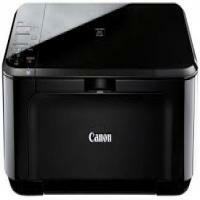 The Canon Pixma MG3100 is a compact and lightweight printer (around 5.5 KG). It prints, scans and copies your documents (All-in-One). The printing and scanning resolutions are approx 4800 x 1200 dpi and 1200 x 600 dpi. It is ideal for students (to support their educational assignments) and household users. The printer bundles with getting started and safety guide, setup CD-ROM, one black and one colour Canon Pixma MG3100 ink cartridges. Once you install ink cartridges and connect this printer to the electricity, it enables you to connect their devices to printer’s Wi-Fi network. The Wi-Fi connectivity minimises your efforts to connect your devices (mobiles, laptops, tablets) with long cables and help you get your printing job done easily. You just need to connect it to the internet and you can print wherever and whenever you require. Replacing Canon Pixma MG3100 ink cartridges and loading papers are easy and comfortable task for any new user. The auto duplex printing feature saves time, your effort and paper. Interestingly the printer support wireless photo and PDF printing and scanning from devices like iPhone, iPad, iPod touch, Apple AirPrint and Android devices. These are some key notes explaining about the Canon Pixma MG3100 printer based on specifications and their benefits. The Canon Pixma MG3100 printer is light weighted and all-in-one printer that can print, scan and print your documents and ideal for students and household users. Some interesting features like Wi-Fi connectivity, auto duplex printing, and easy-to-use interface are great for any users to save time, paper and their efforts. Q. Can I use PG-540XL ink cartridges with my Canon Pixma MG3100 printer? BTW, are these premium quality cartridges? A. Yes, PG-540XL ink cartridges are premium cartridges and compatible with your printer. Q. Do you have pack of two of compatible Canon Pixma MG3100 ink cartridges that has both black and colour ink cartridges? How cost-effective are they compared to original brand cartridges? A. Yes, we have a 2-pack set of these ink cartridges which has one cartridge in black and another coloured one. They cost up to 33% lesser than the original cartridges and yet yield the same high quality output. Q. Are compatible Canon Pixma MG3100 ink cartridges available in a multipack also or just single or two-cartridge sets? A. These Canon ink cartridges are available in multipack sets as well. Q. My son has an important project in school for which he needs excellent quality printouts. Can I buy compatible Canon Pixma MG3100 ink cartridges for great quality printouts and cost-cutting? A. These compatible ink cartridges are able to print top quality photos and text documents same as originals. They can print up to 400 pages and would reduce your printing costs by up to 40%. Q. What exactly is a high capacity ink cartridge? In what way is it better than the standard cartridges? A. High capacity ink cartridges contain more ink than standard cartridges and don’t cost more overall. If you prevent frequently, these cartridges are more feasible for you. Q. I have a Canon Pixma MG3255 printer. Will Canon’s CL541XL ink cartridges work with my printer? Do these cartridges work with other printers also? A. Yes, CL541XL ink cartridges are suited for use with your Canon Pixma MG3255 printer. yes, these ink cartridges are compatible with a range of other printers also. Q. Does this printer Canon Pixma MG3100 offers duplex printing? A. Yes, the Canon Pixma MG3100 does offer auto duplex printing and direct printing, thus saves time and money. Q. What should I do if print results are not satisfactory? A. If the print results are not up to the mark, this could be due to white streaks appear on the printouts, lines misaligned, or uneven colour appears. Check the paper and print quality settings first. Check that the page size and media type setting matches the size and type of paper loaded. If these settings do not match, you will not be able to obtain a proper result. If you are printing a photograph, an incorrect paper type setting may reduce the quality of the printout. Also, if you print any document with an incorrect paper type setting, the printed surface might get scratches. The method for checking the paper and print quality settings differs depending on what you are using your printer for. Make sure that the appropriate print quality is selected using printer driver. Select a print quality suited to the paper and to what you are printing. If you notice blurs or uneven colours, increase the print quality setting and retry printing. Replace the Canon Pixma MG3100 Ink Cartridges with the new one, if the problem is not resolved even after changing the media types. Q. What is the ink capacity of the compatible Canon Pixma MG3100 ink cartridges? A. The ink capacity for the colour Canon CL541XL is 15ml and can print 400 pages each, while the black Canon PG540XL cartridge is 21ml and can print approximately up to 600 pages. Q. Is this Canon Pixma MG3100 suitable to be used for homes or small office purpose? A. The Canon Pixma MG3100 is a compact all-in-one printer that is ideal for students and home users. It is light in weight and weighs around 5.5 KG with printing and scanning resolutions up to 4800 x 1200 dpi and 1200 x 600 dpi. It supports wi-fi connectivity and replacing the compatible Canon Pixma MG3100 ink cartridges and loading papers are extremely easy for new users.